Given the plethora of healthcare technology: electronic medical records, consumer health, home health monitoring and pharmacy management solutions – our primary care system should be a highly connected, coordinated system. However, it is still very much fragmented from the patient and provider experience. Therefore, solutions and offerings are needed that enable innovation in the healthcare landscape to drive better care for patients though an integrated primary care landscape. Join Sanjay Cherian, Vice President Product & Strategy, TELUS Health and The Telfer Health Transformation Exchange in this informative discussion on the journey towards a collaborative health ecosystem to strengthen primary care access for all Canadians. As Vice President, Product Strategy at TELUS Health, Sanjay Cherian oversees the development and execution of the organization’s product strategy via product development, strategic partnerships and innovation. Leading a team of dedicated technology, development and product management professionals, Sanjay’s focus is to build and enhance TELUS Health’s primary care products that more than 20,000 Canadian healthcare professionals depend on every day. As a member of the TELUS Health Leadership Team, Sanjay is the senior executive responsible for strategic capital investments across TELUS Health's product portfolio with the aim of driving increased collaboration within the primary care ecosystem, an objective well-aligned with TELUS Health’s ethos of bettering health outcomes for all Canadians. 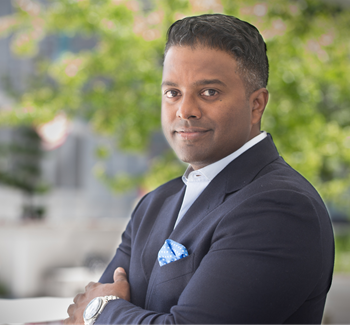 Prior to joining TELUS Health, Sanjay was Vice President, Pharmacy Strategy and Transformation at Shoppers Drug Mart where he led a multi-million dollar business transformation program digitizing its medication management process. From 2004-2014, Sanjay brought his deep knowledge of the healthcare industry to his role of management consultant with Accenture, where he led technology-based initiatives for healthcare clients. Since 2011, Sanjay has served as a Member of the Board of Directors for Healthy Minds Canada, a national charitable organization with a mission to reduce stigmas around mental health via community initiatives. He holds a Master of Health Science from the University of Toronto, and a Bachelor of Science from McMaster University.